I made this for dinner last night and it was a hit!! I didn’t take pictures of all the ingredients because I didn’t even think of posting this until I was getting ready to put it in the oven. So there’s not many pictures. Feel free to use your imagination. 1. In a gallon Ziploc-type bag, place the chicken and cover with Italian dressing. 2. In a separate Ziploc-type bag, place the veggies and cover with Italian dressing. (If you’re making a smaller recipe, it should all fit nicely in one bag. 3. The longer you marinate this recipe the better; you can even make it a few days in advance for an easy week night dinner. I recommend at the least putting this together in the morning and letting it sit in the fridge all day. 4. 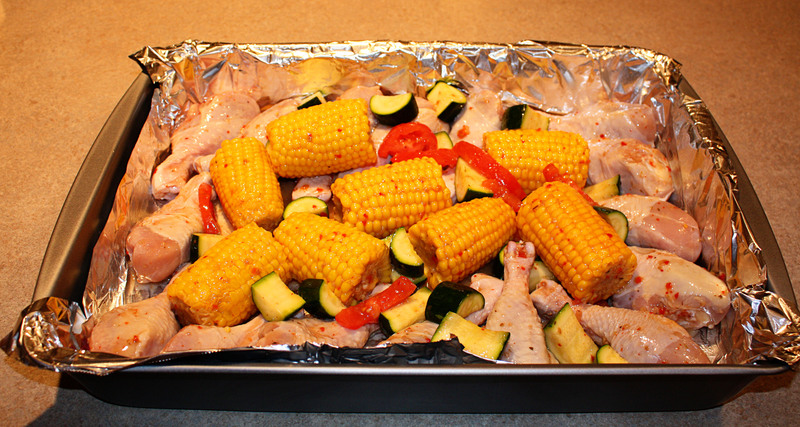 Place chicken legs and veggies in a roasting pan (or smaller depending on the size of recipe you make) lined with foil and non stick spray. I tried to make sure the meaty side of the legs was uncovered and pointed towards the edges of the pan so it would cook better. 5. I had to bake this for 50 minutes because it was such a large recipe. About half way through I turned the corn cobs over so they would bake evenly. It was a hit!!! In the future I will make a lot more zucchini . . . it was delicious. 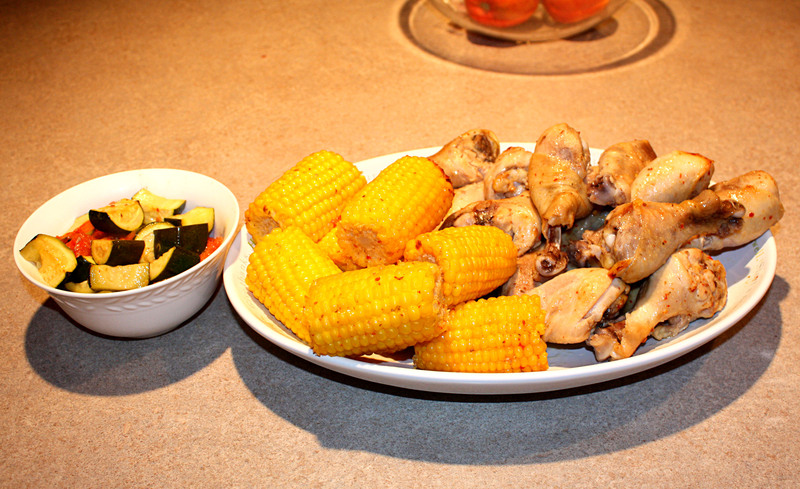 The next day I cut the corn off a couple of cobs, took the meat off the bone and added it to a salad with fat-free Thousand Island dressing. YUM!! This is a quick and delicious way to feed your family or a crowd! Thanks for sharing! I am going to make this SOON!! It looks delish! !